Pushing a stroller has never been so easy. Add comfort and convenience to almost any model with the addition of Easy Stroll. 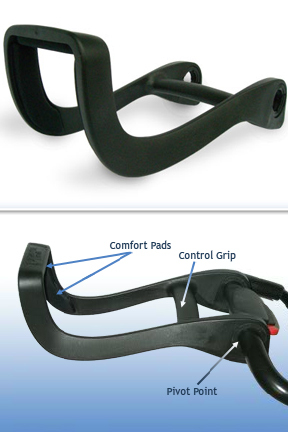 This one handed stroller grip attaches onto the existing factory handle to make your stroller easier to push, more comfortable to hold on to, and more ergonomic for your body. On top of this, it also allows you to push by using just one hand. With a free hand and arm available, you can take the dog with you, talk on the phone, open doors for yourself, carry groceries and other bags and so much more. Thanks to the ingenious design, you are able to maintain control with the use of a single hand, and push the stroller while keeping a more comfortable body position. It installs easily on virtually any non-umbrella style stroller by following simple, step by step instructions. Once on there, it rotates up or down smoothly, so you can choose to operate the stroller the normal way, or flip it up to take an Easy Stroll. Soft foam on the hand grip and where your forearms touch offer cushioning for maximum comfort. For many of us, the existing handle on our strollers is just too short. 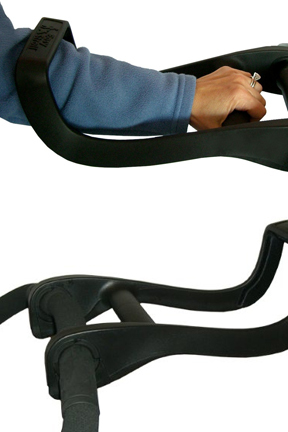 Plus, it demands that you use two arms while pushing, or lose control. Because of this, you are forced to walk directly behind the stroller, hold on with both hands, and hunch over awkwardly while pushing. This positioning and mandatory two-handed operation is uncomfortable for anyone, but for larger folks, it can be impossible. The unnaturally low grip causes your spine to curve, so over time, pain and fatigue will set in. With Easy Stroll your grip is set back a few inches, so you are standing farther away from the stroller, and you do not need to bend in order to grip it. Easy Stroll is operated using just one hand or the other, so you can offset your body if standing directly behind is not comfortable. Because of how you hold and stroll with it, this device allows you to stand up straight while walking, so your back will not strain or tire. Dads will love this attachment because it will mean no more kicking the stroller as you walk, no more running over toes, and no more slumping and slouching to hang onto the handle. Easy Stroll offers a much more comfortable way to push a stroller, so you will be able to walk longer without any pain or back strain. More than just comfort and ergonomics, Easy Stroll offers loads of convenience. One of the biggest problems when pushing a normal stroller is that you have to use both hands in order to stay straight or maneuver turns. With Easy Stroll one hand is always free to do anything else, and you do not give up any control to gain this benefit. Simply walk with your unused hand swinging naturally, or take advantage by grabbing your keys to open the car, taking a drink without stopping, or holding the hand of another child as you go. This one handed stroller grip will allow you to open doors for yourself, carry bags from the store, check the mail, hand someone a toy, take the dog for a walk and so much more. Just imagine all of the hassle you will avoid, and all of the great things you will be able to accomplish that were once impossible. You almost always need a free hand while walking a baby in a stroller and Easy Stroll gives you this freedom. Before Easy Stroll, operating a stroller with one hand was impossible for most people, and reserved for short bursts for those that could handle it. If successfull, it usually didn't last too long, and would almost always result in back, neck or arm pain. All of that has changed with this great device. With Easy Stroll, you are not even really using your arm to do the work, so there is very little risk of any strain. The leverage of your whole body will be doing the work for you because when you hold on to Easy Stroll, the stroller becomes an extension of your own body. Simply change the direction you are walking and the stroller will effortlessly change positions with you. To turn the stroller to the right, walk slightly to the left. The leverage of your entire body will easily turn the stroller to the right. Some of the control still comes from your arms, but most of the control comes from moving your feet. It only takes a little bit of practice to make operation like second nature. Soon after, your walks will never be the same. Gain more control and make strolling easier and pain free. Walking while holding the Easy Stroll is far more comfortable than the regular handle on your stroller, and also gives you a free hand. Stand with better posture, and be free to do more than just push when you add this great one-handed grip accessory to your stroller. Order Yours Today! Length 15" x 8" x 6"
Compatibility fits the following strollers: Baby Jogger, Baby Trend, Bob, Britax, Bumble, Ride, Chicco, Cosco, Eddie Bauer, Graco, InSTEP, Jeep, Joovy, Kolcraft, Mia Moda, Peg Perego, Phil & Teds, Safety 1st, Schwinn, The First Years, Tike Tech, Uppa Baby, Valco Baby -- or any other stroller that has standard handle with rubber or foam hand grips. Uses push a stroller with one hand and make using one more comfortable. 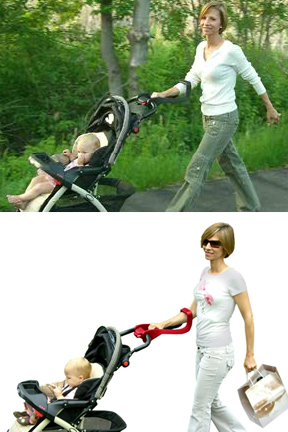 Easy Stroll - The most comfortable way to take a walk with your baby. 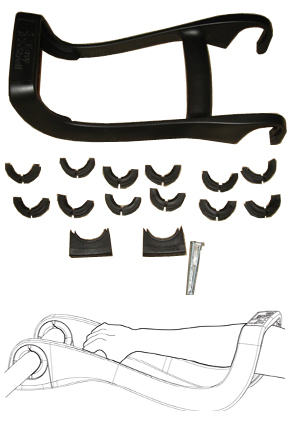 Easy Stroll fits on almost any stroller to turn the factory handle into a one hand operated grip that is much more comfortable to use. Order Yours Today!